We have enjoyed a beautiful spring. 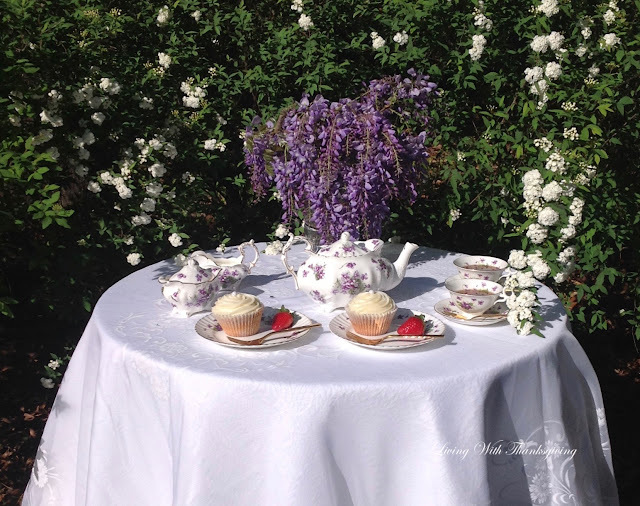 I love the delicate scent of wisteria and thought the purple color of the flowers would accent this lovely vintage tea set with violets. Yes, I was blessed to receive the teapot and sugar and creamer along with the china that I posted about here. I'm glad you joined me today. 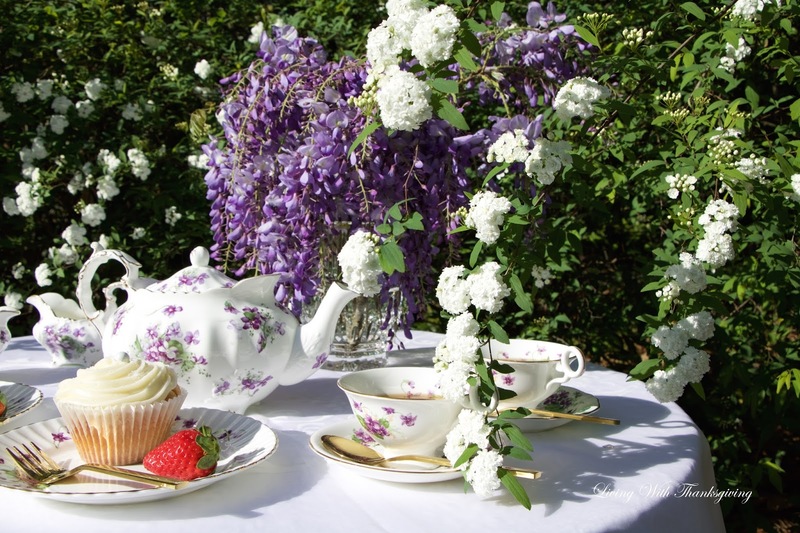 Relax, imagine listening to the birdsong, smelling the intoxicating scent of the wisteria, the warm of the spring sunshine on your shoulders, sipping tea out of delicate china cups and savoring the taste of delicious cupcakes. Upon close observation the teapot, plates and cups and saucers are different patterns but they look lovely together. The plates and some cups and saucers are Embassy Ware Bone China, Fondeville, England and some of the cups and saucers are Radfords Bone China, England and Adderley Bone China also English. Let me share a little history that I know about the china. Google says it was made in the 1940's and 1950's. My husband's Aunt Joyce from Houston, Texas, received this china from her aunt who lived in New York City. She used it for years and now has graciously given it to us. It must have been fun for Aunt Verna to collect this china in the 40's and 50's. I absolutely adore the shape of the teapot. It is Victorian Violets from England's Countryside made in England by Hammersly. The gold gilding is so pretty and the delicate sprays of violets make my heart sing. Wonderful memories of picking wild violets in the woods come to my mind and warm my heart when I think about describing this sweet pattern. The shape of the creamer and sugar are equally beautiful. The plates have a pretty scalloped and ribbed design with gold trim. Can you imagine the taste of this decadent cupcake? And sipping a great cup of tea that just tastes better out of a china teacup? 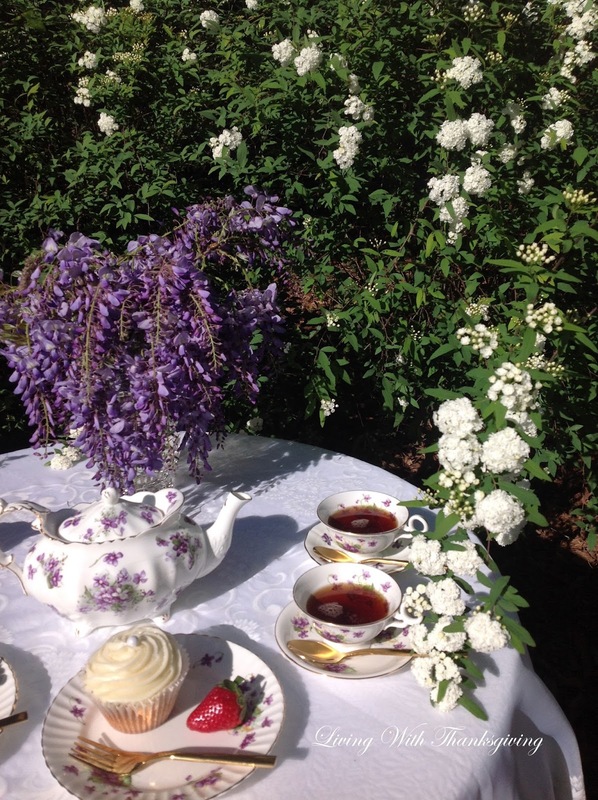 I was so pleased my bridal wreath was blooming to be a backdrop in the garden for a spring tea party. The pound cake cupcakes came from a little shop near my home and I have to be careful to limit my stops there. I love tea parties and a tea set passed down to three generations is quite special. Feeling blessed to share about it today. Bonnie, that is gorgeous! You have some beautiful things, and an equally beautiful space to enjoy them in. Life is good! I love your pretty tea table! Knowing who had owned these pieces and passed them on to you makes them even more special. I love violets and have several china pieces featuring them. Different patterns but they do all seem to play well together. Bonnie, this is exquisite. When I saw your IG, I literally swooned. It is so special that you have beautiful things that have passed through generations. 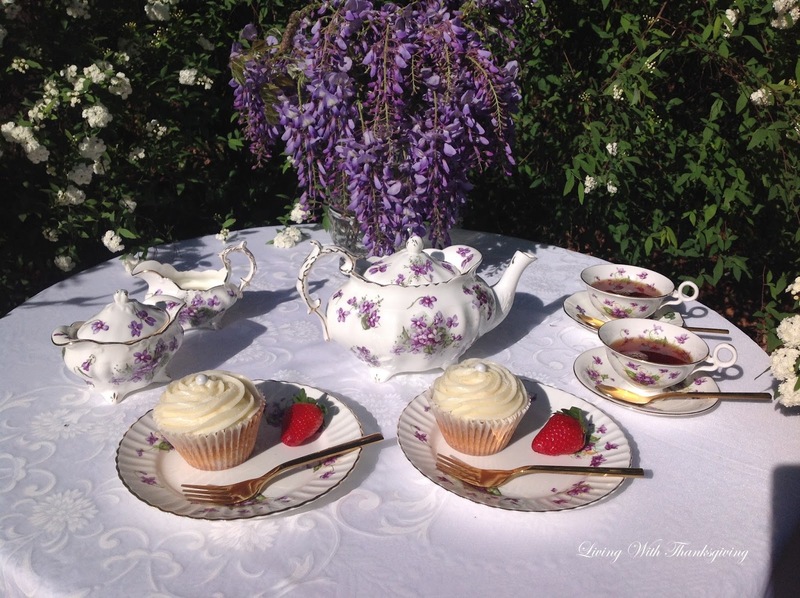 I would love to be sharing tea with you with this backdrop of your garden, sipping from the delicate cups, and indulging in that decadent cupcake! Bonnie, this table is so inviting. I also love the shape of the teapot and the cups with their cute little handles. The wisteria and bridal wreath are the perfect backdrop. This is inviting to all the senses. A beautiful gift and you have debuted it perfectly. Bonnie, what a beautiful setting! I agree with you. I love the shape of that teapot! It would be such a treat to sit at this gorgeous table. I can almost smell the wisteria. Enjoy your weekend! Dear Bonnie: I do believe you wrote this post just for me. I adore anything connected to taking tea. Before I retired I actually took a class, taught by an admiral's wife who was from England, on how to prepare and serve a formal tea. It was wonderful. Your teapot and tea service is fabulous. Like you, I so love the shape of your teapot. And, the violets remind me of spending hours with my mom gathering them. She would make tiny jars of violet jelly, which were a taste of spring when the snow was deep. Many thanks for this lovely post, I am completely transported to a sweet time in your magnificent garden enjoying the sights and sounds of glorious spring. Oh Bonnie, what a lovely setting. I do adore your teapot. I'm doing more with Rita's things too. So special. And I love your garden. One day I will dine in outdoors again. Really. I will! Oh Bonnie, what a gorgeous tea set! Yes, the shape of the teapot is exquisite. I wish I could join you at your pretty garden table, and admire the china and your yard. This china is gorgeous! I've never seen any like it before. How perfect is it with the wisteria? Lovely post! I so enjoy when our friends share a post that has such heart, gentle memories and beautiful treasures. Just like you I enjoy setting a table with dishes that have been gifted to me from my family. 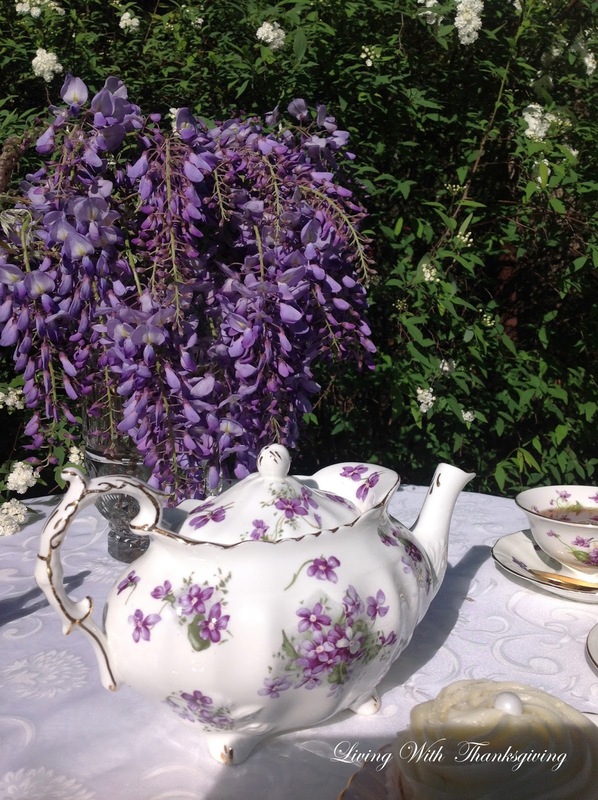 This heirloom tea set is gorgeous and so is this fragrant wisteria! Enjoy your upcoming travels, I will be thinking of you! That beautiful china brings back happy memories of tea at my aunt's house. Your garden table is just lovely. Your wisteria is lovely and I know, so fragrant. Would love to have some here. We do have a bridal veil spirea bush that is probably about 40 years old. I love its old-fashioned charm. I hope you have a great weekend! 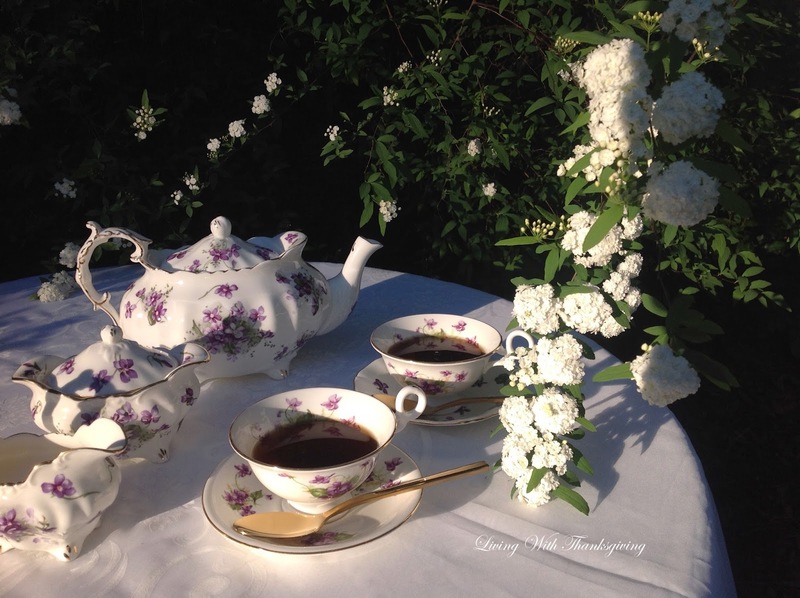 Your garden is the perfect setting for a little tea party. What a gorgeous family heirloom. I love the sweet violets. This is so lovely. I love the purple violets and especially your bridal wreath background. What a setting! I could even sit there without the cupcake! So beautiful! All of your posts are so pretty, and I love how you spend so much time outdoors in your beautiful garden. 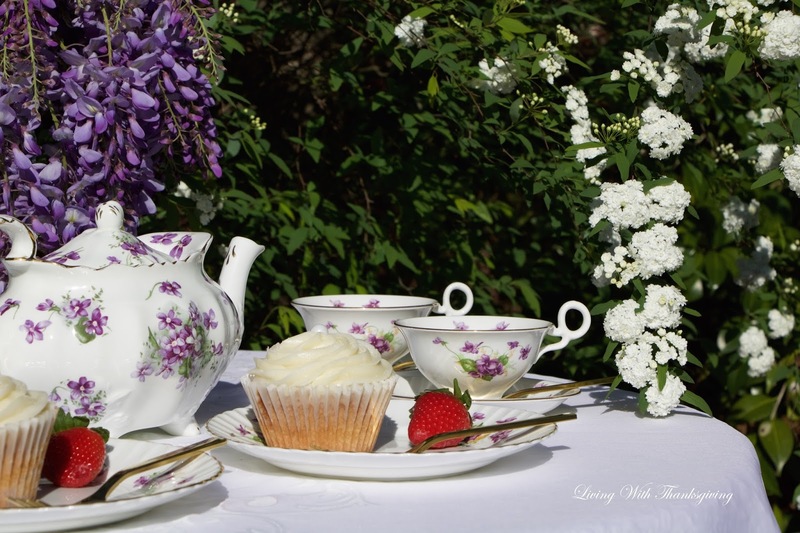 Pretty purple flowers on the tea set! Bonnie, this is such a lovely setting. 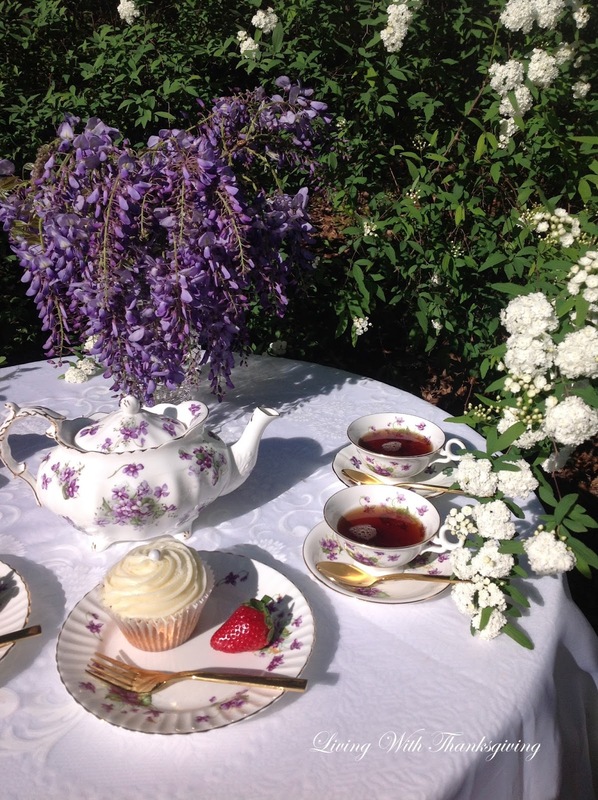 Your garden setting and the color and fragrance of wisteria are the perfect backdrop for your aunt's china. How special that you have this set to enjoy. Nice tea set, wishing to have a cup of tea on your cup! What an absolutely lovely way to enjoy a nice spring day. Thanks for such a great article here. I was searching for something like this for quite a long time and at last I’ve found it on your blog. It was definitely interesting for me to read about their market situation nowadays. Well written article Thank You for Sharing with Us.